When it comes to the films of Luc Besson, it’s often hit or miss. Sure, he’s directed many successful films, like Nikita (1990) and Léon: The Professional (1994), but some of his recent fare like The Family (2013) have left me disappointed. One of his best films is the sci-fi space opera (literally, even), The Fifth Element (1997). When I learned that he would be returning to this genre with Valerian and the City of a Thousand Planets (2017), I certainly had high hopes for it. After viewing it for the first time, I can unquestionably say that my expectations were certainly met. Because Valerian has a French comic book series as its source, some of my qualms with this film might lie with the source material, and not the director. Some may recall the originality that came from another French comic book adaptation in the form of Snowpiercer (2013). Valerian certainly has its moments of originality, like a cross-dimensional marketplace for one, but it still maintains the style and tropes of the space opera genre. Even though the source material came out long before Avatar (2009), some of its plot points felt derivative of the James Cameron sci-fi film. That being said, the alien creatures in Valerian were almost more along the lines of The Hitchhiker’s Guide to the Galaxy (2005) than say, Star Wars (1977). While I honestly loved the spectacle and quick pacing of Valerian, the big reveal of the plot could be seen a mile off. 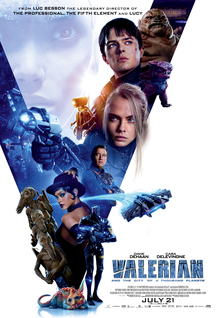 Furthermore, I truly enjoyed the banter between Valerian (Dane DeHaan) and Laureline (Cara Delevingne) but was somewhat put off by DeHaan’s acting, which seemed to be along the lines of a Keanu Reeves impersonation. Despite all its weaknesses, Valerian was a fun film and probably the best entry in the space opera genre in years, if not decades. A tight and entertaining follow-up to Besson’s The Fifth Element, I give Valerian and the City of a Thousand Planets 4.0 stars out of 5.